Join us and share the wonderful spirit, music and culture of West Africa on our weekend NZ Drum & Dance Camp. Renowned West African music specialist Simon Fraser (Melbourne) is heading back to NZ and is joined by Djembefola Boubcar Gaye (Senegal/ Melb), Accomplished Hamilton based Nathan Bregmen and dancer extraordinaire Monica Evans. Simon: Simon has been drumming his heart out all his life! He’s been studying, performing, recording and teaching across the world since the 1990’s & founded Melbourne-based African Drumming in 1997. Over 25 African tours & experiences with myriad African ensembles have opened his heart to the subtleties and intensities of West African music. Simon’s percussive skills and knowledge of all forms of traditional West African music are highly respected, while his education programs have brought drumming to thousands of people from all walks of life. His passion and knowledge translate to his teaching where he focuses on dexterity, groove, honouring tradition and having fun. Boubcar: Bouba first laid his hands on a drum in Senegal at the budding age of 14. Inspired by the musical mentors around him he became a member of the prominent Mama Afrika. Bouba’s skills and passion grew quickly and soon he was also a member of the renowned Foret Sacre Ballet. In 1997 Bouba ventured to Europe and then onto Japan where he established himself as a leading African percussionist. Based in Melbourne, Bouba is now a regular and respected figure on the International performance and teaching circuit and loves his annual role at Bali Drum Camp. With an energy and peace of mind that resonates from deep within – Bouba speaks a thousand words with his drum. Nathan: Nathan Bregmen has been playing drums for over 20 years, and has been studying African drumming for around 10 years. Captured by the ability of African drumming to build community and bring people together playing music in a short space of time, the African djembe has quickly become Nathan’s instrument of choice. His light-hearted but attentive teaching style has quickly made him a favourite with many students around the country. Monica Evans: Monica is a dancer, musician and creative facilitator, with a passion for getting people moving, connecting and celebrating through rhythm and movement! 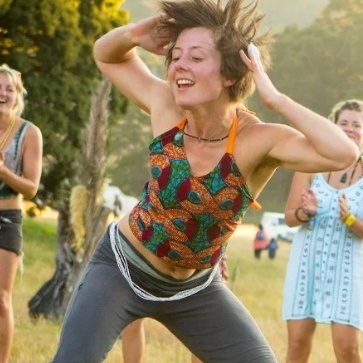 She’s been studying African-Inspired Dance for eleven years, and now runs her own community dance organisation NIKA Dance (www.nikadance.co.nz). She lives in Whaingaroa/Raglan, and loves finding new ways to move and be moved! 5:00pm – 7:00pm – Arrive and settle in. Meet and greet. 7:00pm – 9:00pm – Introductions and all in workshop. 8:00pm onwards – A night of African village Music, Stories, Proverbs, and Melody. 2:30pm – 3:00pm – Final group performance of rhythms we have learnt over the weekend.